With interest rates inching up, businesses in the consumer staples industry have seen their valuations contract as their high dividend yields become relatively less attractive. Besides some of the major international players to be caught up in the mix, one consumer staple company which recently got caught in my screening process was B&G Foods (BGS). With a market cap of only $2.0 billion, B&G Foods is a company whose name some readers may not be familiar with. However, it is these smaller companies with less analysts following them and little stories written about them in the business newspaper which can often have the most opportunity. The company is currently hugely beaten down, being valued at only 9.8x P/E and with its dividend yield pushed up to a rich 6.3%. The name B&G Foods is derived from Bloch & Guggenheimer and the B&G brand which was founded in 1889 by these two families and went on to produce pickles, relish, olives, sauerkraut and other specialty food items. Today, the company is an amalgamation of brands with a few dating back over 100 years. Some of their brand names that caught my eye as I scrolled through their corporate website were Green Giant vegetables, Cream of Wheat cereal, Mrs. Dash seasonings, Ortega taco products, Twin Sugar artificial sweetener, and Back to Nature foods to name only a few of the brands in their portfolio. The publicly traded B&G Foods we know today was formed when a group of investors got together in 1996 to purchase Bloch & Guggenheimer Inc. and Burns & Ricker Inc. (whose bagel chip business is now known as New York Style). The company continued to grow with sales increasing from $129 million in 1996 to around $1.7 billion today aided by 20 acquisitions over that time period. B&G Food’s 2015 acquisition of the Green Giant brand from General Mills (NYSE:GIS) for $765 million basically doubled the company’s size. 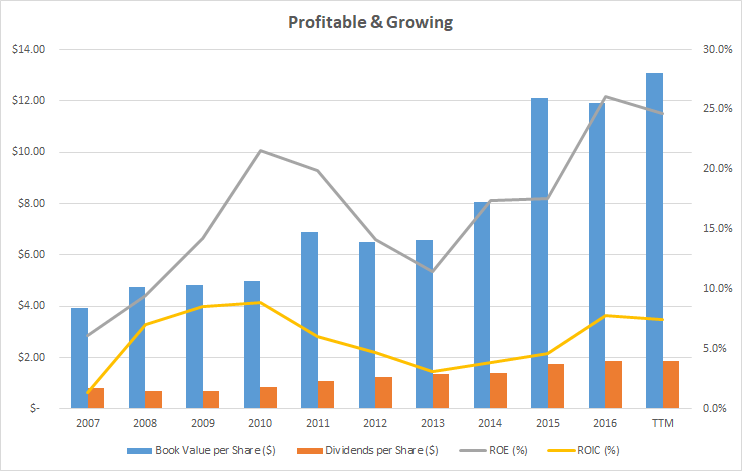 Having a bunch of brand name products in the portfolio has allowed B&G Foods to be decently profitable with return on equity (ROE) and return on invested capital (ROIC) averaging 16.6% and 5.8%, respectively, over the past decade. This average level of ROE is above my rule of thumb of 15% ROE, but has increased in recent years to end the trailing twelve-month period at 24.7% as can be seen in the graph below. This increase in ROE has been due to greater use of financial leverage which will be touched upon in more detail later. However, the average ROIC over the past decade is well below my rule of thumb of 9% which gives me pause to think if the company’s brands are strong enough to allow it to sustainably earn returns above its cost of capital. As readers of my articles will know, I am always wary of acquisitions as a lot can be what Peter Lynch has coined as “diworsification,” which is when a business expands for the sake of revenue growth and diversification only to reduce returns for the overall invested capital of the business. Since the modern company’s inception in 1996 through the merger of Bloch & Guggenheimer Inc. and Burns & Ricker Inc., B&G Foods has placed huge importance on acquisitions as a means to expand the company’s portfolio of brands. Many of these acquisitions have been bolt-on acquisitions of small brands, but the Green Giant acquisition in 2015 was quite transformational for the company as previously mentioned. As I take a look through the company’s balance sheet and profitability, it seems in my opinion that B&G Foods has been making smart acquisitions. 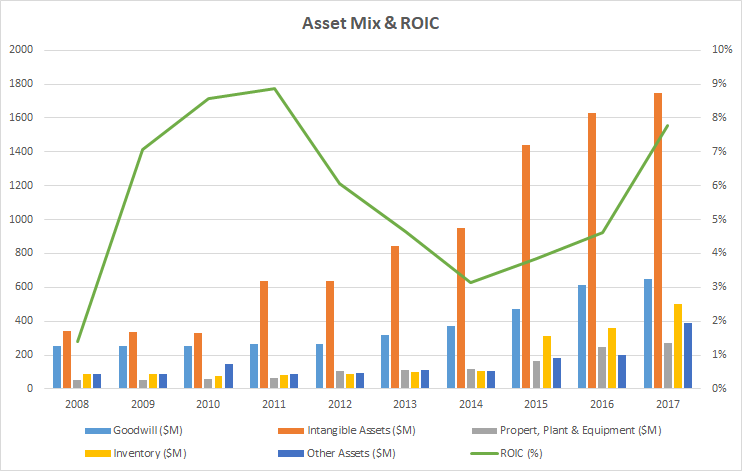 This is evident through the fact that ROIC has remained at an acceptable level even though goodwill and intangible assets have swelled as a percentage of total invested capital. While taking a dip in 2011, the company’s ROIC seems to be recovering in recent years possibly as synergies from past acquisitions slowly work their way into the operations. As previously mentioned, ROIC of 5.8% is nothing to get too excited about, but adding leverage onto these acquisitions and ROIC has made a nicely profitable company for shareholders. Alongside B&G Foods’ acquisition strategy, there has been an always high debt load at the company and continuous share issuances. While financial leverage has not increased in recent years, it remains quite high currently around 4x. In terms of interest coverage, this high debt load translates into operating income only covering interest payments 2.6x. The company is familiar with toeing the line, having had interest coverage ratios of only 1.3x back in 2008 after the last recession. Being a consumer staple company affords B&G Foods some stability in revenues and highly leveraged consumer staples companies are not uncommon. That being said, the company’s acquisition strategy combined with this high use of debt leave a great deal of risk if management were to ever overpay in a poor acquisition. B&G Foods’ current valuation is quite tempting at 9.8x P/E and the fact it pays out most of its earnings in dividends and certainly yields 6.3% only adds to its allure. Potential investors, however, should remember about the company’s high debt load and management’s tendency to toe the line on their interest coverage. The company’s average ROIC at 5.8% over the past 10 years is below what I like to see in a great company and management is raising ROE through a rather aggressive use of debt. Looking at B&G, I am reminded of a favourite quote of mine from Warren Buffett: “It’s far better to buy a wonderful company at a fair price than a fair company at a wonderful price”. If you enjoyed this article and would like to read more of my work, click the follow button at the top of the page to receive notifications when I post a new article! Disclaimer: While the information and data presented in my articles are obtained from company documents and/or sources believed to be reliable, they have not been independently verified. The material is intended only as general information for your convenience, and should not in any way be construed as investment advice. I advise readers to conduct their own independent research to build their own independent opinions and/or consult a qualified investment advisor before making any investment decisions. I explicitly disclaim any liability that may arise from investment decisions you make based on my articles.